There are 33 Assisted Living Facilities in the Dayton area, with 16 in Dayton and 17 nearby. 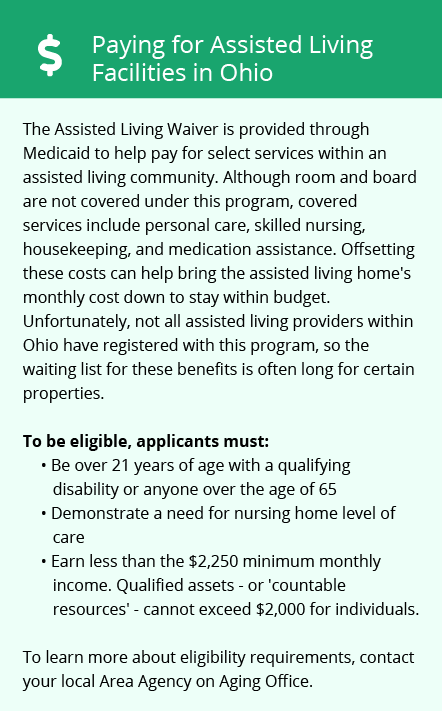 The average cost of assisted living in Dayton is $2,976 per month. This is lower than the national median of $3,346. To help you with your search, browse the 212 reviews below for assisted living facilities in Dayton. On average, consumers rate assisted living in Dayton 4.0 out of 5 stars. Better rated regions include Kettering with an average rating of 4.6 out of 5 stars. Caring.com has helped 21 families in Dayton find high-quality senior care. To speak with one of our Family Advisors about assisted living options and costs in Dayton, call (855) 863-8283. Dayton, in west-central Ohio, is the home of many inventions including the cash register, aviation equipment and the pop top, all resulting in many museums in the area to keep history buffs busy. Some museum visitors might be among the 16,674 seniors living in Dayton, and some of those seniors may be in need of some light assistance with tasks like housekeeping and medication management. There are 16 assisted living facilities located in Dayton to support these seniors. In Dayton, as in the rest of Ohio, assisted living facilities are called Residential Care Facilities (RCFs) and are licensed by the Ohio Department of Health. Ohio, including Dayton, is moderately tax-friendly which may help seniors have more money to contribute toward their care. Although retirement income is fully taxed, pensions are only partially taxed and no taxes are applied to social security income. The Dayton Regional Transit Authority (RTA) operates a public bus system in the area that services Dayton and all its surrounding suburbs. This makes it easy for seniors to get to doctor's appointments, malls, and other attractions outside of the inner city. The cost of a monthly bus pass is discounted for those 65 years of age and older. The Dayton area is home to world-class medical facilities including Grandview Medical Center, in the event of medical emergencies or illness. The cost of living in Dayton is 75.1, almost 25 points lower than the national average of 100. Healthcare also ranks lower at 89, suggesting that Dayton might be affordable for seniors with tight budgets. Crime rates in Dayton are 45.9 for violent crime and 70.6 for property crime, both significantly higher than the national averages of 22.7 and 35.4, respectively. Despite the high crime rates, seniors living in facilities are generally protected by security measures like cameras, guards, and alarms. Temperatures in Dayton are moderate with summer highs of 87 and winter lows of 22. The city only sees 176 sunny days annually, 71 days less than the national average of 205. Seniors may want to ask staff about activities to keep them occupied during inclement weather. Assisted Living costs in Dayton start around $2,976 per month on average, while the nationwide average cost of assisted living is $4,000 per month, according to the latest figures from Genworth’s Cost of Care Survey. It’s important to note that assisted living rates in Dayton and the surrounding suburbs can vary widely based on factors such as location, the level of care needed, apartment size and the types of amenities offered at each community. Seniors in the Dayton area might qualify for financial assistance to help cover the costs of residing in an assisted living facility. 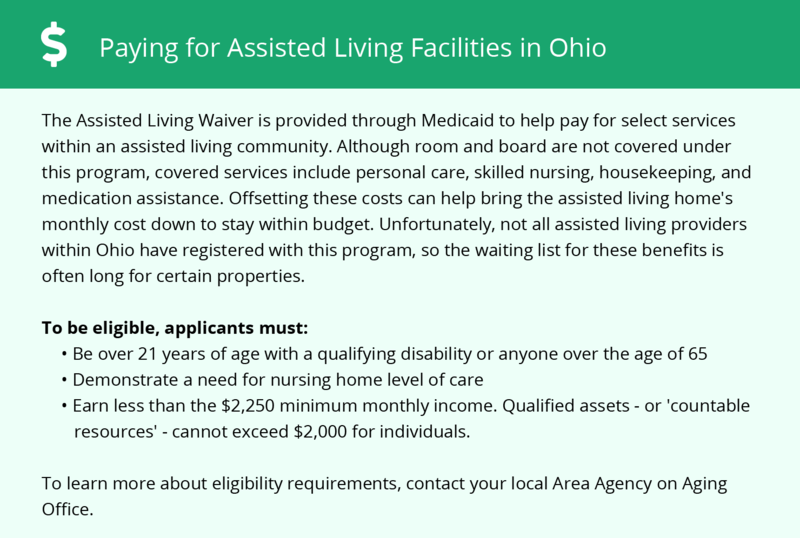 There are two options available — the Nursing Facility Level of Care Waiver, which is part of the state's Medicaid program, and supplemental SSI payments. Both programs are run by the state and can be applied for at the county's Department of Job and Family Services Office. To see a list of free assisted living resources in Dayton, please visit our Assisted Living in Ohio page. Dayton-area assisted living communities must adhere to the comprehensive set of state laws and regulations that all assisted living communities in Ohio are required to follow. Visit our Assisted Living in Ohio page for more information about these laws.